We love checklists! 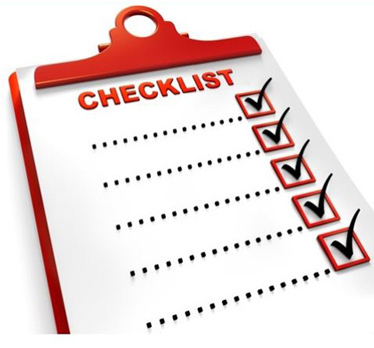 Whether it's for honey-do chores or making sure our production staff gets your transcript out without a hitch, detailed checklists keep things on track and minimize stress. Scheduling a deposition is easy - simply pick up the phone or send an email, right? But if your paralegal doesn't have all of the pertinent information, or if that information is not communicated to the court reporting firm, you run the risk of getting into some sticky, time-consuming, or expensive situations. To help avoid those situations, we've created this checklist. If attorneys will be participating from various locations around the country, it's helpful to list what the deposition start time is in the different time zones, such as, 12 noon Eastern, 11 a.m. Central, 10 a.m. Mountain, 9 a.m. Pacific. Be sure to give the scheduling department the correct address as well as the phone number at the location. If there is anything unique about how to find the location (for instance, if the signage isn't readily visible from the road, or the building is tucked away in the back of an office park), let them know. Also, let them know if there are special instructions for arriving before the regular operating hours of the business. We understand that even the attorneys can't provide an accurate estimated length of the job, but they'll generally know ahead of time if they anticipate a deposition to last 30 minutes or all day. The reporter will be there as long as is necessary (and we've burned the midnight oil on a few occasions) but knowing an estimated length will help us to assign the best reporter for the job. If a reporter has a transcript backlog, is leaving on vacation soon, or has evening commitments, we take all of that into consideration when scheduling. Email the reporter a copy of the case caption, pleading, or notice. Include the names and contact information of opposing counsel and whom they represent. If the case is technical or has specialized vocabulary, the pleadings are most helpful. If you know you will be taking multiple depositions in the same case, let the scheduling department know. They'll make every attempt to have the same reporter cover each deposition. Do you need a videographer? What about an interpreter? Will you need a videoconference set up? Do you need to use our conference room facilities? If you know you'll need the transcript sooner than our standard 10-12 business day turnaround, make sure to tell the scheduler at the time of booking. If you know you'll need it overnight or within two or three business days, advising the scheduler ahead of time is even more crucial. It's also helpful to give the scheduler the trial date, because cases closer to trial are more likely to result in expedited transcripts. At Winston-Salem Court Reporting, we feature "Green Delivery." Our standard transcript package includes a PDF version of the full-size and condensed transcript (4 pages printed on one page), with exhibits scanned and attached, and a TXT file. Hard copies of the transcript and exhibits are optional; please let the scheduler know if you'll need a hard copy (other than the original).